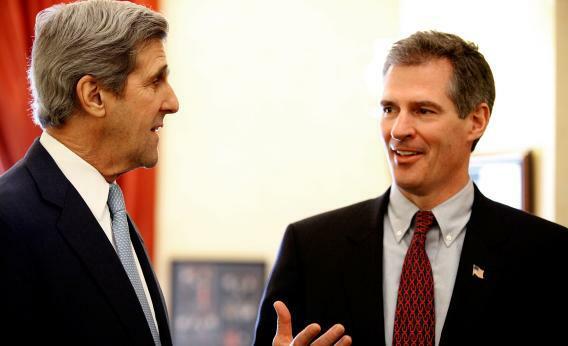 Scott Brown meets with John Kerry in Kerry’s office on January 21, 2010. Do you remember those months Democrats spent panicking that Scott Brown would rise again if John Kerry’s Senate seat opened up? The panic that started roughly three weeks before Brown even lost his old seat to Sen. Elizabeth Warren? I was not at all certain that a third Senate campaign in less than four years, and the prospect of returning to a Congress even more partisan than the one I left, was really the best way for me to continue in public service at this time. Brown’s still free to run for governor—Republicans don’t really have a more popular candidate—and free to run in 2014, when this Senate term naturally expires. But a Public Policy Polling survey this week, the first since Ed Markey and Steve Lynch received substantial media coverage about possible runs, gave Brown a meager 3-point lead over Markey. Four out of five undecided voters told the pollster they’d voted for Warren over Brown in 2012. His fate was tied to the national GOP. Who else do Republicans have to run, on short notice? They were pleased with the campaign openly gay state Rep. Richard Tisei ran for a House seat last year, and there’s always the possibility of convincing some rich person (like Mitt Romney, but not him specifically) to jump in. But they were counting on Brown. Endless, half-informed column inches were written about how risky it was to nominate John Kerry to run the State Department, because surely the guy who just got ethered by an Oklahoma-born law professor was going to swoop in and save his seat for Republicans. This is your daily reminder to ignore most political reporting that’s based on but-what-ifs.